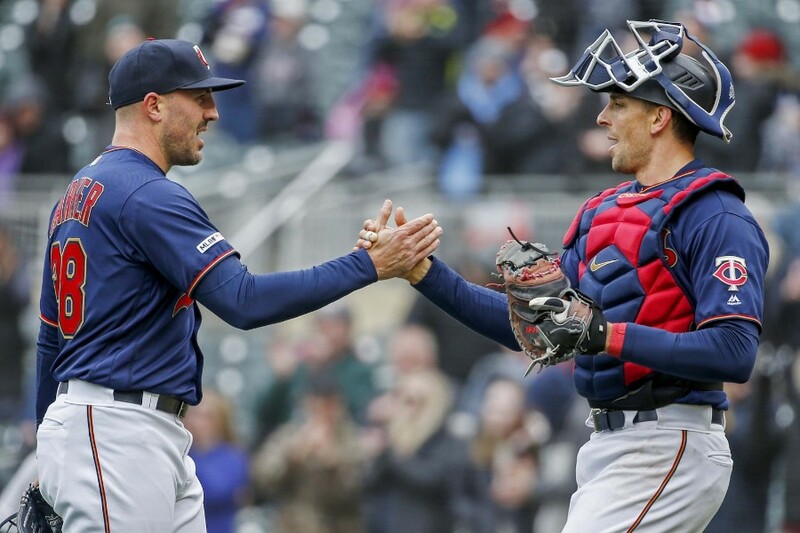 Detroit did about all it could to hand today’s game to the Twins, issuing seven walks, but the Twins didn’t seem all that interested in obliging. Michael Pineda had a quality start and the bullpen trio of Trevor Hildenberger, Taylor Rogers and Blake Parker held the Tigers scoreless to secure a one-run victory. At first glance this doesn’t appear to be all that bad of an offensive performance, but the Twins got their four runs on just five hits, all of them singles. The Twins had an excellent scoring chance in the bottom of the seventh, but let it slip through their fingers. The Tigers walked the first three batters of the inning, but Jorge Polanco and Nelson Cruz both struck out and Eddie Rosario flew out to center field. Not that the Tigers exactly impressed, either. Again, with game time temperatures just above freezing, this was not a great day to hit. In the top of the third inning, Pineda induced what appeared to be a double-play ball, but it ricocheted off the second-base umpire for what was scored a single. That loaded the bases with no outs, and Detroit was able to capitalize by scoring two runs that inning. Luckily, the lineup had Pinada’s back. The Twins answered in the bottom of the third, scoring all four of their runs on the day without the benefit of an extra-base hit. Rosario provided the big hit, a two-run single. That inning ended with Rosario trying to trail Cruz as they both attempted to advance bases on a fly out to center. I’m guessing Eddie assumed Cruz would draw a throw to third base. Instead, Rosario was thrown out at second to end the inning. 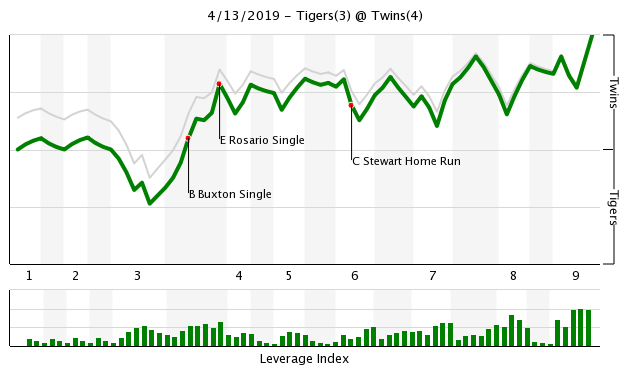 Luck continued to trend in the Twins’ direction in the top of the fourth, as Pineda had an eight-pitch inning thanks to a line-drive double play. Pineda was going right after Tigers hitters, and after striking out five more batters while not issuing a walk today, he has an incredible 7.50 strikeout to walk ratio (15 Ks, 2 BBs). Trevor Hildenberger was the first man out of the bullpen, taking over a clean inning for a change. He’s already inherited 11 runners this season, allowing three of them to score (27%). In all of last season, he only inherited 25 runners, 14 of which scored (56%). Hildy delivered a scoreless inning, Taylor Rogers pitched a scoreless eighth inning and Blake Parker came in for the ninth. Parker put the tying run on with a one-out walk and allowed that runner to advance into scoring position due to a wild pitch. But just when it looked like things were slipping away, Parker struck out the next two batters to earn the save. Jorge Polanco had a single and a sacrifice fly at the plate, and also made a great diving catch to end the first inning. Marwin Gonzalez was 0-for-4 with a pair of strikeouts. His passive approach has paid off the past couple seasons, but it seems to be working against him so far this year. He took seven strikes today and was called out looking both times. I talked a bit (very briskly) about Marwin’s approach yesterday evening. A win is a win is a win. Let’s hope this is the game Cruz needed to get his timing back. Is Parker looking to follow last year's closer?Walks, runners in scoring position before putting them away - Rodney seems to have made a career out of this - can Parker continue to succeed? Good to see Pineda go 6. The bullpen needed that badly. Pineda was great, especially not losing his cool after all the dink and dunk and umpire donk in the 3rd. Hope we get Garv-sauce and La Tortuga back tomorrow. This offense is much more potent with them in there. The ugly moment sticks with me: Twins load the bases on 3 walks - nobody out - and you had to think the game was going to be blown wide open at that point....to get nothing was a real gut punch. Cruz needs a few games to get his swing back, just keep rolling him up there. The way Gonzalez is playing, he's going to start taking a back seat to Astudillo at 3rd sooner rather than later. Interesting video on the non-swinging strikes, Tom...dude needs to get a bit more aggressive it seems. Interesting piece on MarGo.Thanks Tom. Is it too early for me to say the Marwin signing was a mistake, or is the timing just right?? Because with how Astudillo’s been playing and Sano’s upcoming return, I really don’t see the purpose of having Marwin on the team, other than being waste of $21M that could’ve been spent on one year of Keuchel, or any one of Kelly, Herrera, Robertson, Familia, Britton, or Allen this offseason. Hopefully he proves me wrong, although I really doubt he’ll get enough at-bats to do so, unless someone goes down. Even if that were to happen (again), will he perform at the level we paid him to, or like he is right now, an overpaid Adrianza?? Yeah I don't understand why he didn't see any action in Philly and NY. Not sure why Roco decided to sit him for all those games. Can' say a hole lot about the decisions Roco's making because he seems to make the right call all the time. Is it too early for me to say the Marwin signing was a mistake, or is the timing just right?? Because with how Astudillo’s been playing and Sano’s upcoming return, I really don’t see the purpose of having Marwin on the team, other than being waste of $21M that could’ve been spent on one year of Keuchel, or any of Kelly, Herrera, Robertson, Familia, Britton, or Allen this offseason. UMD just scored a third goal on UMass with 3 minutes left. Looks like they're going to go back to back for another NCAA national title in men's college hockey. Nice job Bull Dogs. Ok now its the Twins turn to win a title. World series title. This could be the year. If a guy can have a great night, go 3-4 with a double and a homer, and his stats return back to respectability, it's too early to worry about his performance. Gonzalez has played in only nine games this season spread out over 2+ weeks. Nice job by Castro. All three catchers are an asset to this team. Dude's given up four base runners (1 hit, 3 walks) in 5 innings and has three saves.That's an ERA of 1.80 and a WHIP of 0.80. I'd say that's pretty good. Regarding Marwin? It's way too early to worry about a slow start. Means nothing at this point. His role will be what it was intended to be as soon as Sano comes back. He'll be playing most every day all around the diamond. By season's end, he'll have an OPS between .694 and .759 as he has in four of the last five years. He's going to get about 450 at bats, which means he has about 425 more at bats to improve. Castro was really good behind the plate today.... and he walked twice. He's 2-12 on the season with 3 walks. In Astudillo's last four games, he is 2-14 with one walk. Cruz is always an asset. He gets walks precisely because opposing pitchers don't want to pitch to him. That creates opportunities for other hitters as was the case today. The way Gonzalez is playing, he's going to start taking a back seat to Astudillo at 3rd sooner rather than later. Interesting video on the non-swinging strikes, Tom...dude needs to get a bit more aggressive it seems. I disagree on Marwin needing to take a back seat to anyone just yet, and I'm a little torn on whether he really needs to make any adjustments. Under normal circumstances, I'd absolutely say he needs to start swinging the bat more. But even with him being so passive, the Twins are the most aggressive team in baseball. They have the lowest pitches per plate appearance in all of baseball (3.66). So, I think Marwin being more selective does have some value in terms of balancing things out, and he's bound to turn it around. Things are magnified at the start of the season. Marwin had a stretch in 2017 where he hit .111/.130/.200 in a 12-game stretch. Nobody noticed because it was in late August and he was having a great season. He still managed to slash .303/.377/.530 that year. I guess I will stand by my all three catchers are an asset. I certainly am not going to be swayed by data in minuscule samples. Castro has the best glove and game caller. I am not sure which of Astudillo or Garver has the better bat but they both have a major league bat and catch well enough to help this team. I'm really encouraged by the way that Pineda has pitched so far. What a nice addition to the starting rotation! But ... the concern is how durable he will be this year after his long post-injury layoff. This has probably been mentioned by someone already, and if so I apologize, but do the Twins have Pineda on any sort of pitch or innings limit this season?